Join NovomaticCasino.co.uk as we journey below the waves and into this underwater wonderland! This slot is so wonderfully and uniquely designed that it’ll make you feel as though you’ve dived down deep and into the realm of the mermaids. The beautiful background is filled with coral and fish and stunning mermaids and the music and sound effects are sea-sational! Even the symbols and the cards in the gamble game are themed. Sirenas has so many bonus games and features for players to enjoy that it will keep you entertained for hours and its RTP percentage means that it’ll also keep you winning! Player who enjoy playing our other Novomatic slot games, such as: Dolphin’s Pearl Deluxe, Mermaid’s Pearl and Lovely Mermaid will love this underwater slot, as will any well-seasoned slots fans who enjoys a slot with loads of bonus features and not just one where you spin the reels and hope for the best! 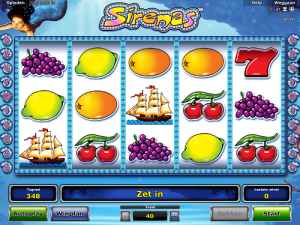 The symbols in Sirenas slot game are a lovely mix of old-school classics and themed wonders. The classic symbols are the fruits: the grapes, cherries, oranges, lemons and plums, along with the red seven! The themed symbols are the higher-paying symbols and these include an anchor, a sailing ship and the Sirenas logo symbol! The Wild symbol substitutes for all other symbols except the Scatter symbol. The Scatter symbol is a beautiful mermaid and if you spin three or more of her, you will trigger 10 free games! During these free games there are so many other bonus features you can trigger and win! This bonus can be triggered at any time – during the normal games and during the free games. When this bonus gets triggered you can receive free spins or bonus cash! During the free games, if you spin three bonus symbols while the crab is at the top of the screen, you’ll trigger the crab bonus! For this, three crabs will scuttle onto your screen and give you wins in the form of multipliers of your bet! Free cash? Yes please! During the free games, if three bonus symbols fall while the fish is at the top of the screen, lots of different colour fish will start swimming across your screen and each colour will be a different multiplier. Watch as the hook catches a fish and gives you your bet multiplied by that number! Fingers crossed for a big fish! If you spin three bonus symbols while the chest is at the top of the screen, during the free games, three different chests will appear at the bottom of your screen. You’ll need to pick them to open them and inside you’ll find different multipliers and you’ll get free cash! Aside from all these bonus features, there are still some standard ones which our players will have come to know and love. You can play Sirenas for free and in autoplay mode. You can also gamble your wins in this slot game by using the 50/50 chance, double-or-nothing card gamble game!